If you're running Windows 7 or 8 - even a non-licensed copy - Microsoft will still let you get Windows 10 for free. Remember when it came to light that the latest version of Windows could be downloaded as a free upgrade? Well, even though Windows 10 hadn't been revealed yet, Microsoft is still moving forward with its plans. What's surprising is the update won't distinguish between legitimate and pirated copies - if you're using a cracked version of the system right now, it will become a licensed copy as soon as Windows 10 launches. "We are upgrading all qualified PCs, genuine and non-genuine, to Windows 10," Terry Myerson told Reuters. 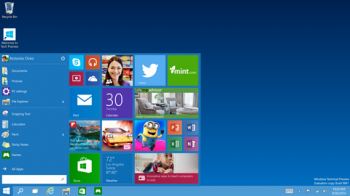 Myerson also noted that Windows 10 would launch this summer, outside of Microsoft's traditional fall release window. Why give pirates copies of Windows 10 for free? As it turns out, it's to combat the ludicrous piracy figures in China, where approximately three-quarters of PC software isn't licensed. According to Myerson, upgrading unlicensed copies of Windows will help Microsoft "re-engage" with hundreds of millions of potential customers who otherwise would slip through the cracks. "Anyone with a qualified device can upgrade to Windows 10, including those with pirated copies of Windows," a Microsoft representative later confirmed at the Verge. "We believe customers over time will realize the value of properly licensing Windows and we will make it easy for them to move to legitimate copies." This perfectly explains why last year's "free upgrade" story came from Microsoft Indonesia, where the issue is more prominent. Thankfully, the free upgrade will be available worldwide - so anyone reading from Windows 7 or 8 will be definitely be able to check it out this summer.